Is it real or is it Bummerex? Hard to tell! But the copy that came with it is interesting! "Trefethen- a varient of the Cornish name Trevethen, ... Trevathen and Trevethan.... from the placename Trevathan, in St. Eval, Budock or Gwennap. 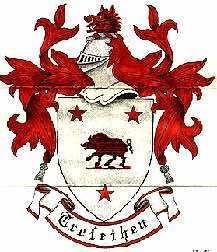 ... Trevethan... meaning "homestead in a meadow". BACK to the TREFETHENS & TREFRENS!